Back in October, I shared with you all that I was upping the ante on my style and really defining what I like. I went and had a personal styling session at my local Nordstrom and also have been clearing out my closet and replacing things with items from Stitch Fix (anyone interested in my thoughts on how that’s going, comment below. I even have my husband trying it now for men). I’ve really been loving seeing my color scheme come together in a very Steffanie-way and a big part of that has been replacing my accessories. I used to have lots of chunky, statement pieces and that’s just not very me. 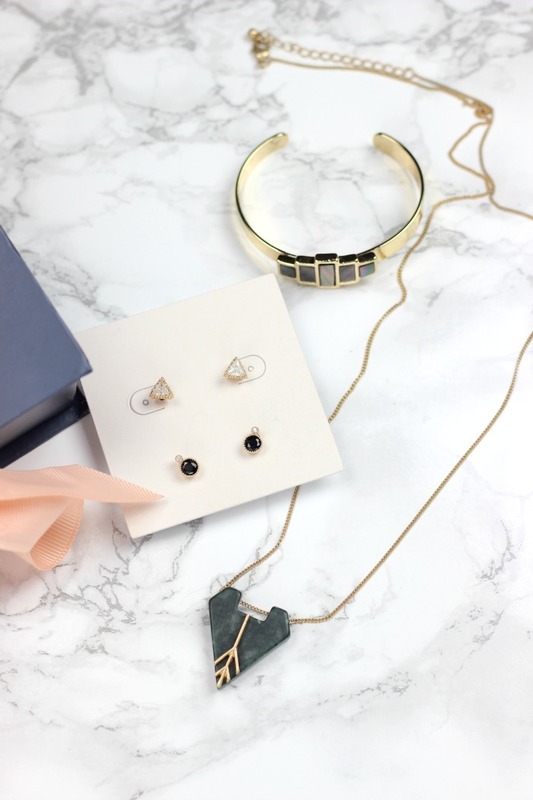 I prefer slightly edgy, more delicate pieces and I’ve been trying out Rocksbox – a jewelry rental subscription box – to help me play with different styles. Today, I wanted to give you a Rocksbox update to tell you how it’s been going and also how you can try your first box totally free with a coupon code I have! I’ve received four boxes since I started trying Rocksbox. I love how fast the shipping is and that they’re constantly getting new pieces in so I can add them to my ‘wishlist’ and hopefully try them quickly since you can ship back your box as often as you want during the month. 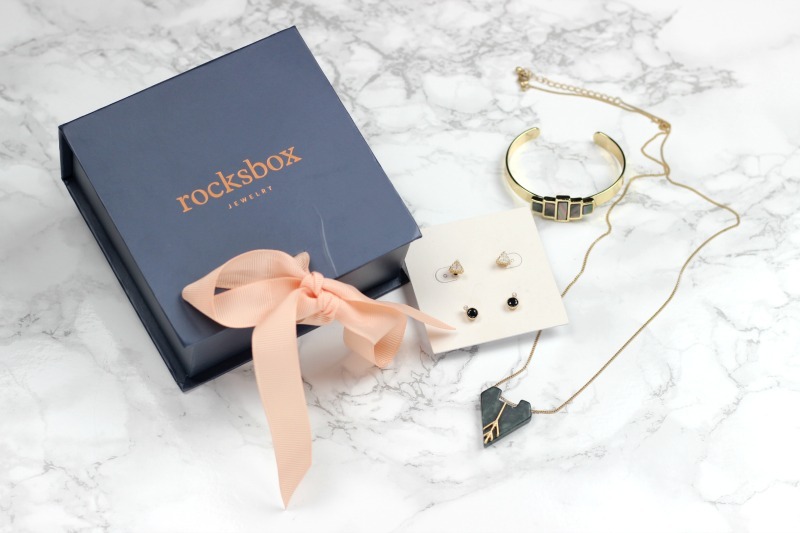 Rocksbox typically costs $19/month and they send you three pieces of jewelry based on your style/taste/preferences. Want to keep all three pieces for weeks on end – that’s fine! Want to switch it up every week, just send back the box with the pre-labeled shipping address! No matter what you decide, it’s still $19/month. If you LOVE the pieces, you can purchase them at a special members-only discount (which I totally took advantage of this month). I was having serious buyer’s remorse for not picking up the white marble stone pendant from my first box, so I was SO happy to receive it in a deep forest green shade this time around! I wasn’t sure if this would match with a lot of my outfits, but if you know me, you’re probably laughing. Girlfriend owns a TON of green/olive/neutral clothes so this pendant is perfect. It’s also not too long, so it lays really pretty and different. No surprise… I purchased this one. The other pieces included an adjustable cuff bracelet with abalone stones – also super versatile and matched with a ton of stuff, as well as, paired well with the necklace. Lastly, was a set of two stud earrings in crystal and black stones. I had no issues wearing all three of these pieces together – and on their own. My stylist did an excellent job! If I wanted to purchase all three of these full price, it would be $138. 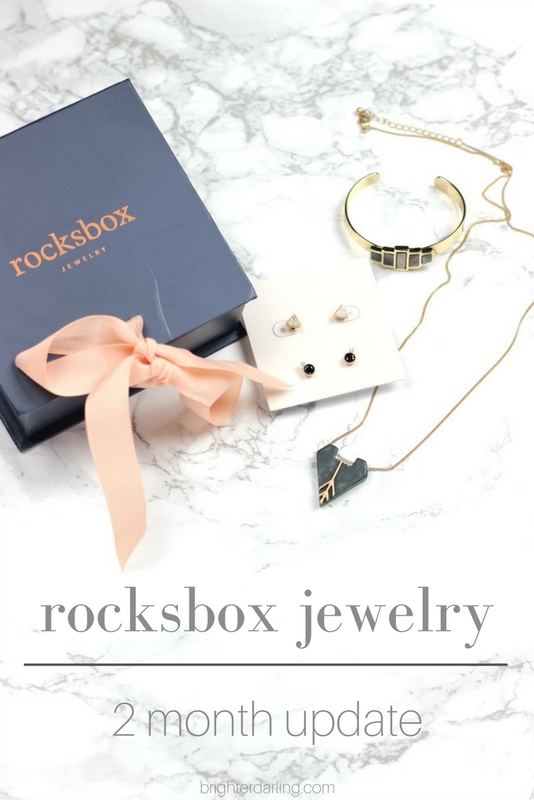 With Rocksbox, it would be $114 – plus, there’s a $10 credit on your account each month to use at any time… so I could have picked them up for $104 (a 25% discount)! "Loving Lately | Winter Skin Care Must Haves"